Pharr Community Events Director Gary Rodriguez, Mayor Ambrosio Hernandez and JoJo from radio station KTEX-FM are seen after the announcement of Pharr Hub Phest at Pharr City Hall. 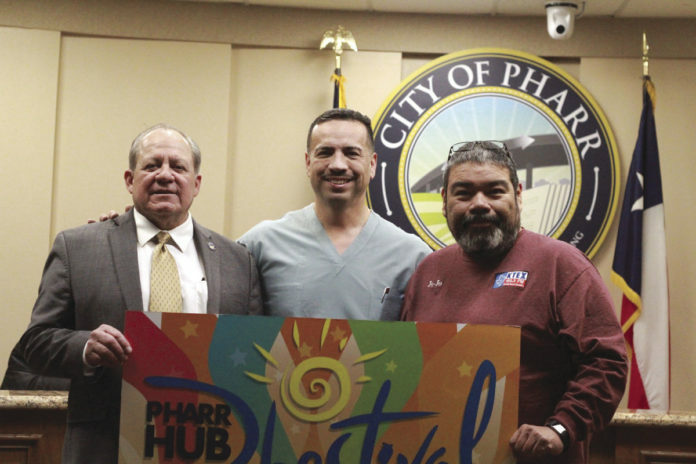 Animal lovers, country music fans and luche libre enthusiasts can unite in the “hub” of the Rio Grande Valley for Pharr’s HubPhest on Saturday. Due to the city’s unique location, the event serves to attract “visitors from all over the Valley to meet in the middle to celebrate,” city media specialist Eddie Villa said. Exhibits for the celebration include a petting zoo, motorcycle show and a Texas rattlesnake roundup, in which the instructor braves entering a pit full of the venomous reptiles. Bird watchers are in for a treat with a “birds of prey” display. The annual event will be held from 4 p.m. to midnight in downtown Pharr near the town hall, located at 118 S. Cage Blvd. Entry is free before 5 p.m., and $5 the remainder of the evening. Food booths, carnival rides and a dog show are a few other activities lined up for all ages. Registration for a sanctioned grill-off is still open and the winner of the “jackpot” will be announced at the Food Bank of the RGV. Several new music acts are being introduced while other more familiar artists will make a return, according to Villa. Drew & the Dancehall Dreamers, Texas Dezire and Bo Garza are a few who will take the stage. At 10 p.m., headliner and country music superstar Easton Corbin will perform.